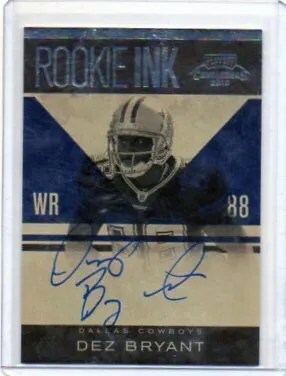 The Contenders brand is a pioneer in the Autograph Rookie Card industry since it started the ‘Rookie Ticket’ Autograph cards in 1998 long before auto RC’s were standard in every box. They have also had interesting and varying print runs of almost all players – which makes it fun for collectors to find out which RC Autos are SP. 2009 Panini Contenders Football had its share of SP Ticket Autographs, and hopefully this year will too. You will find on card signatures of the top 2010 NFL Draft Picks this season. In each 12 box case find 6 Autographs (on-card) of: Sam Bradford, Tim Tebow, Ryan Mathews, Jahvid Best, Dez Bryant, C.J. Spiller, Dexter McCluster, Demaryius Thomas, Mike Williams, Ndamukong Suh, Golden Tate, Jimmy Clausen or Colt McCoy. *Some Tim Tebow cards have ‘GB2″ inscribed underneath signature.